At Kona Beach Hostel we strive to offer our guests the best experience while staying with us. Our staff members are very friendly and can provide you with information about Big Island so you can make the most out of your experience in Hawaii. We are located in the heart of downtown Kailua-Kona, steps from Ali`i drive and all the action Kona-Town has to offer including; Kailua Pier, numerous bars, restaurants, shops, farmers market, and numerous beaches. 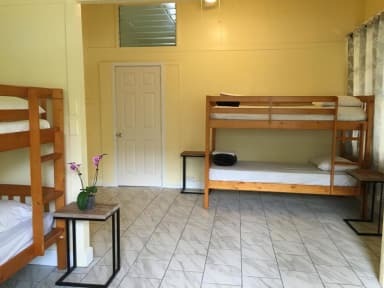 We are only 2.5 miles from the famous Magic Sands beach, directly across the street from Honls beach, and a 20 minutes drive from world famous snorkel, scuba, and hiking locations including Captain Cook trail head & monument, 2 Step Bay, and Kealekekua Bay. We have snorkeling gear, boogie boards, coolers and beach chairs for rent for discounted rates for our guests. 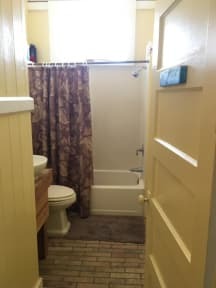 Our facilities include co-ed and female dormitories as well as private rooms, a fully equipped communal kitchen, shaded common areas to chill and talk story, BBQ grill, laundry area, Wi-Fi and free conventional parking. Check in from 11am-2pm or 5pm-10pm. Refunds shall not be given for cancellations during special holidays, Christmas (December 15 - January 10,and Iron man Triathlon (October 7th -20th). 7 Night minimum stay private rooms only not the dorm rooms during Ironman tournament & Christmas season (dates listed above). We do not accept guest younger than 16 years of age. No real doors for the private rooms (iron frame to lock the room + thin curtain). Floor in room was not clean. Not enough toilets. There were construction works going on the site making noise very early in the morning (during the quiet hours) and without an actual door there's of course no way to keep any noise at all outside. Paper on fridge says cleaning of fridge on Monday but they throw away stuff anyway on other days as well.